Ormston House is proud to present Alan Butler’s new film Le Moment Fabriqué (2017) at Les Rencontres D’Arles in France. The film will be part of the Night of the Year at the Papeteries Étienne on 7 July and exhibited at the Atelier de la Mécanique from 9 July to 24 September 2017. 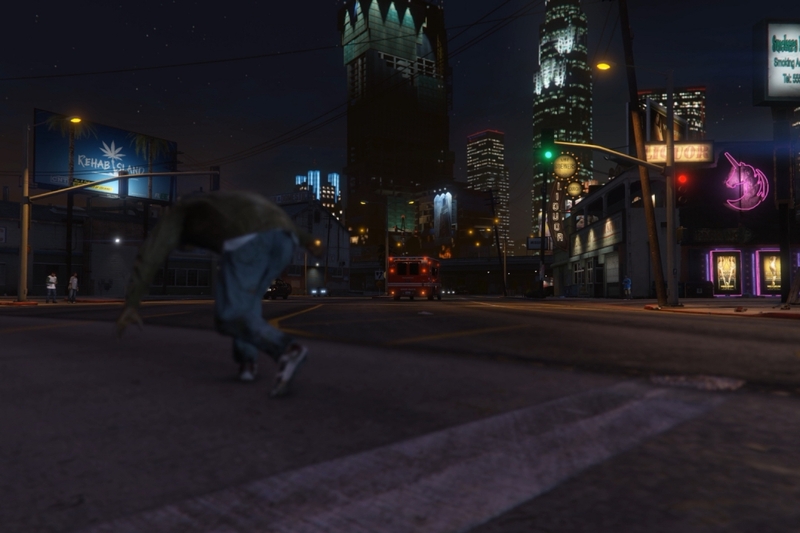 Le Moment Fabriqué is the first film from the on-going project Down and Out in Los Santos (2015-). Alan Butler’s Down and Out in Los Santos is series of photographs created by exploiting a smartphone camera feature within the video game Grand Theft Auto V. Players of GTAV can put away the guns and knives, and instead take photos within the game environment. Adopting a photojournalistic approach, the series aims to engage in a sort of social-realism for the software-age, documenting poverty and the lives of the homeless within the video game environment’s socio-economic hegemony. Embarking on daily photographic expeditions within this video game, the artist has spent two years capturing these people, their surroundings, the infrastructure, and hopefully the symptoms and causes of their states of being. These individuals do not provide the game with any functionality, but exist merely as an ambient human presence. The initial result is thousands of quasi-photographic images, which depict moments of intimacy between the artist and these virtual people: waiting for eye-contact with the simulant, using depth of field to draw focus to objects, poses, limbs, and capturing personal moments. While the inhabitants of Los Santos possess only a superficial amount of artificial intelligence, it is possible to have real emotional experiences in their presence. The characters are aware of the artist’s presence as he photographs them, some ignore him, other times he is attacked and must defend himself. They chatter to each other, they share alcohol and cigarettes, they ask for money to buy drugs. Programmed to self-identify, they congregate with those in similar social situations to themselves. For full details, visit the artist’s website here. Alan Butler is represented by Green On Red Gallery, Dublin. Every summer since 1970, over the course of more than forty exhibitions at various of the city’s exceptional heritage sites, the Rencontres d’Arles has been a major influence in disseminating the best of world photography and playing the role of a springboard for photographic and contemporary creative talents. In 2016, the festival welcomed more than 100,000 visitors.